The initial meeting of the Vancouver Rhododendron Chapter was held one spring evening in 1955 in the home of Des Muirhead. 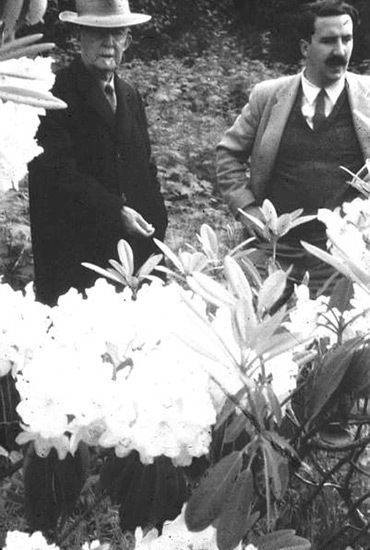 Muirhead and his partner Clive Justice were the leading landscape architects of Vancouver. 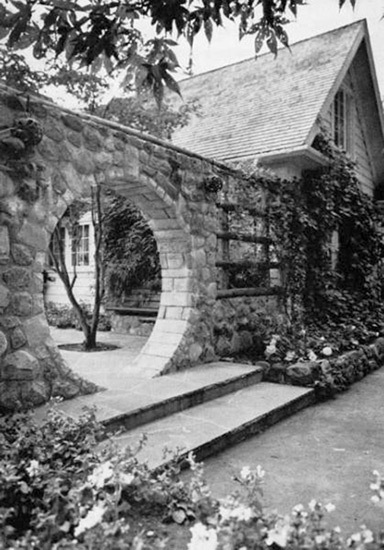 They had designed the gardens of several of Vancouver's rich and famous. These were all invited to the first meeting; several attended and joined; others joined but never came to any meeting. Hyland Barnes had the original Southlands Nursery. He would evaluate the person coming to his nursery by holding them in conversation, from a window in his house. If they sounded like money he would descend. If not he stayed put. Hyland Barnes was a first class plantsman and would go to the trouble of finding rare plants for customers. It was he who found, for Ellen Hailey, Magnolia dawsoniana at Clark's Nursery of San Jose. It is now in the Grieg garden (Ceperley Park) and is the largest magnolia in Vancouver. Bill Bradner joined every garden society in the city. Free with advice, in later years he disappeared from the horticultural scene. Cyril Chave was a school teacher at Prince of Wales High School. His wife, a social worker, a graduate of U.B.C, she never spoke those letters, she breathed them. Chave had a single track outlook. His interest in rhodos was to create three different groups of plants. The first would be early flowering, the second late flowering, and the third all with throat blotches. This last group had the untidy Rhododendron 'Sappho' in the background (purple blotch), a popular plant for the last 140 years. There were two pinks, 'Mrs. G.W. Leak' and 'Mrs. Furnivall', with crimson and purple centers. For blue there was 'Blue Peter'. I have forgotten the yellow. So rare were any rhodos here that one day we went down to a nursery in Bellingham. Then, it was a big deal to leave Canada. From rhodos Chave then moved to clematis and from them to double Ghent azaleas. The Ghent azaleas go back to the 1800s when a baker, in the town of Ghent, made crosses between the American deciduous rhodos. By 1900 the Sunningdale Nursery had 400 named varieties on their books. Today it is impossible to purchase a single one. Their place has been taken by the flamboyant Exburys. The first Ghent that Chave saw was a lovely pink hose in hose in Eddie's nursery. This posed a challenge, so Chave started collecting, from every part of the world, others of this double Ghent group. In the end he had the world's only near complete collection. I was born in New Zealand and did an adult apprenticeship at the great nursery of Duncan and Davies. I sailed to England in 1950, meeting on the ship, Barbara, my future wife. I spent three years with Sunningdale Nurseries, specializing in rhodos, then came to Vancouver where in 1955 I became a member of the Vancouver Civic service. In 1965 I helped moved 8,000 plants from Royston, Vancouver Island, to Vancouver. In 1970 another 1,000 came from the E. J. Trayling nursery to Vancouver. The Hailey collection of species was lifted from Nanaimo, and from the Hawthorn garden came another truckload. With all these rhododendrons I created the plantings in Central Park; the area between the two quarries in Queen Elizabeth Park; the Sino-Himalayan area in VanDusen Botanical Gardens; the Ted and Mary Greig garden in Stanley Park, and also the plantings in the old zoo and train area. I also chose the plants for the rhodo and azalea walks at VanDusen Botanical Gardens. Then, too, with Rex Murfitt, I moved the Simpson collection of several hundred plants from Cowichan Lake to the University of Victoria. The Flavells were customers of Muirhead and Justice. In the Flavell's garden grew a large 'Sappho' with very yellow foliage. I said, if he was permitted to spread lime around it and it died, I would replace it with two plants. Flavell let me do it. The yellow leaves were replaced by healthy new green leaves! The use of lime goes back to the 1930s when the New Zealand Government was promoting its use on farms. Trials were laid out by the Young Farmer's Club (Y.F.C. ), consisting of large squares of pasture. In the first square superphosphate, in the second super + lime, in the third basic slag, and in the fourth slag + lime. The young men mowed and weighed the grass from each square. They learned that lime released nutriments to give a greater yield. In 1948, Duncan & Davies applied lime to their six-acre stock beds in which grew their rhodos, camellias and magnolias, besides masses of other genera. The plants loved it. In 1959 the Vancouver Chapter went out to Surrey to the fertilizer works that produced fertilizer for every brand sold retail. In 6-8-6, 20% was fertilizer; what was the other 80%? Apart from inert substances the principle component was lime! From then on, I have limed any plants that looked unwell. At Haney there were three keen growers, Fred Collins, Dr. Rhodes and Eric Langton. The latter grew from seed any rhodo he could obtain. His greatest contribution to the society was his beautiful daughter who is now a chapter member. The Freemans were customers of Muirhead and Justice. Their garden grew the usual basic rhodos. Only one, 'Britannia', was unhappy. The plant has fine trusses of "near" scarlet flowers, will not root from cuttings, and was then obtainable only from Holland. There the grafted plants were grown in the rich peaty soil of Boskoop. When these liners came to Sunningdale this soil was beaten from them and the remaining roots then grew in Sunningdale's poor soil. When the Freemans' plant was dug up it was found that the roots had not, in several years, moved from the rich Dutch soil. It received the Sunningdale treatment and then thrived. Henry Eddie, a nurseryman, who like others was not sure people would buy rhodos, so it was up to the chapter to convince him. He had been growing four inferior plants from George Fraser. They were the poorest of the poor, inferior to any other group. Dr. McKee had retired to Sumas Mountain. When he moved from Vancouver he took with him a mass of seedlings. These were hybrids and species, derived from seed of subsection Fortunea, which had been sent to him from Edinburgh, Scotland. I would visit Dr. Mckee in his aerie on sunny afternoons. First a visit to the row on row of rhodos and then a lie on the warm grass looking at the view down the Fraser River. Dr. McKee sat in his chair smoking his cigar. We would talk a little, look in silence a lot and thusly spend a peaceful afternoon. He looked like Colonel Saunders of K.F.C. the Dexter estate in Sandwich, Massachusetts. contractor: Len Living; foreman and mason: Peter F. Jeck. Ellen Hailey had worked for Dr. McKee in his forensic laboratory in Vancouver. At the first meeting of the VRS she became secretary, a forceful lady who developed a greater rhodo knowledge than any other member. She remained secretary until removed by a new group who wished to promote the chapter for their commercial activities. When that happened, old chapter members loaded her garden into a 40-foot trailer and moved it to her new home in Nanaimo. She knew and could recognize the truss of every rhodo grown in the Vancouver area. Once she wrote a show card for an entire show without once checking the plant's tag. Lil Hodgson was another Muirhead and Justice customer. Len Living was a landscape contractor who created most of the gardens designed by Muirhead and Justice. He later made his property into a nursery. Then finding that too great a burden, he joined the Vancouver Parks as a nursery propagator. Evelyn Weejes, then Miss Jack, worked at U.B.C. under Dr. Neil. It had been decided to make rhodos the major plant on the campus. She it was who had to go through lists to choose which ones to grow. She then sowed them, grew them on, and with her husband to be, prepared them for the campus. She also propagated cuttings sent from England by Dr. Walker. These became in time the Rhododendron Species Foundation. For this she was awarded the ARS Gold Medal. South of the border in the U.S. were nurseries that had started after the ARS was formed. In 1947 when the ARS was started, John Henny estimated that 25,000 rhodos were grown in America. The tiny nursery at Royston, Vancouver Island, growing only species, was 20 percent of that total. It followed that if local members wanted different hybrids they had to go south. Twice a year I went there searching for new varieties for charter members. Because I was bringing in more than my quota, it was understood that I would get the bills made out at half price. Only once was I ever cheated when a doctor up the Valley at Mission, who had a large order of Exbury Azaleas, paid only the amount on the bill, refusing to pay the other half. That set me back one month's income! Once this load included 20 clematis for Cyril Chave in gallon cans. It was fun searching for them in odd nurseries. and built by Clive Justice of Desmond Muirhead and Associates Landscape Architects. Mrs. Greig and Mrs. Milner were Vancouver Island people. Up the Fraser at Whonock, Norman Whittall had his weekend home. He and his son were both clients of Muirhead and Justice. Attached to the house was built a very attractive patio of warm red Arizona sandstone. A most elegant Moongate of the same stone was set in enclosing walls of natural rock. In his garden attached to the house a patio of Arizona sandstone was built. It was a cold winter. With Peter Jeck, Len Living's German foreman driving, the Italian stonemason and the French cement man in the front enclosed cab, I had to ride in the open back. I laid down two 12” x 2” planks, climbed into an old sleeping bag and had an extra hour of sleep. We also planted a field with several hundred azalea seedlings. Bea Davidson lived down the road from Dr. McKee. She was one of the early settlers to Canada who came with lots of money and no knowledge of farming. Result, everyone cheated her. After a long yarn, Harry Carter estimated she had spent $100 and had nothing to show. From Dr. McKee she obtained cuttings which she raised and sold. Once she and I took 60 plants to a Mr. Marquis at Nelson. He had a hobby garden beside the river, growing rhodos that he had obtained from somewhere! When I showed his slides to a group at UBC, one person attending was E. J. Trayling, who at that time lived on Main Street in Vancouver. He sold that house and moved to Surrey, where with the help of his friend Larson of Tacoma, he created a beautiful garden. Then he purchased a property at Clearbrook and played in a much larger manner. Unfortunately no one lived out there and as many of his plants were stolen, he finally withdrew selling his rhodos to the Vancouver Parks Board. His colour slides formed a crucial part of my life. 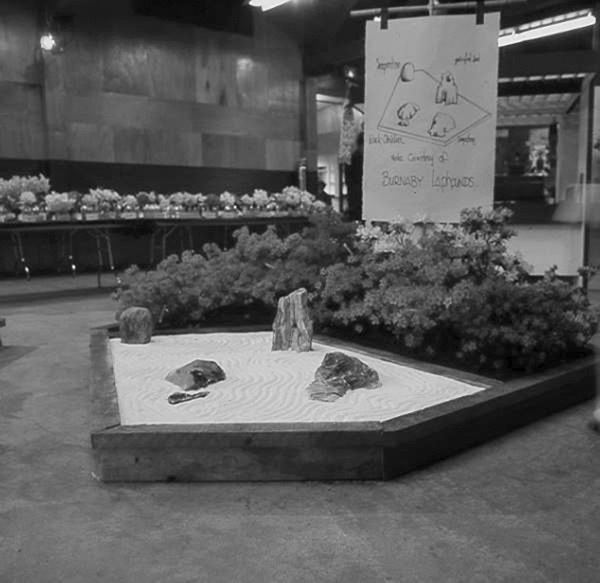 It was not until 50 years later that he realized that they were the only colour slides or photos taken at Sunningdale Nursery, the Chelsea Flower Show, Windsor Great Park, Wisley, Exbury, and Constant Spry, during the early 1950s. In those days after the War, no one yet took colour slides or photos. So from those early slides the Vancouver Chapter and a number of organizations as far south as Portland were able to see, enjoy and benefit. In the late '90s members of the Halifax Chapter converted the slides into eight CDs. They retained a copy of each, and a second copy went to the Lindley Library of the Royal Horticultural Society in London (England). "The only colour record of that period," wrote the librarian. I also retained copies for myself. Alleyne Cook is a member of the Vancouver Chapter and a recipient of the ARS Gold Medal.